Its true, frogs come in all shapes and sizes as the two in the picture demonstrates. 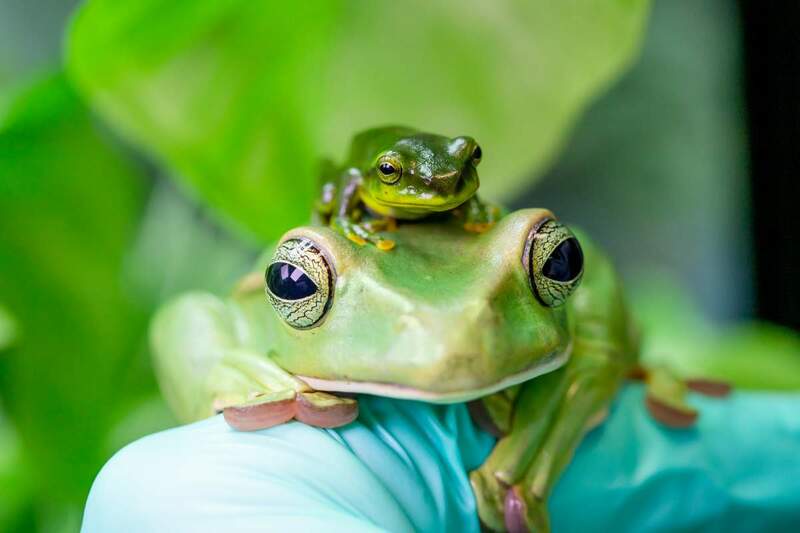 On the 20th March 2019, Paignton Zoo celebrated World Frog Day. The day, was marked by the breeding of Thao Whipping frogs for the very first time at the zoo. Like so many species of exotic frog, this one goes by different names. The Thao whipping frog aka, Fea’s tree frog, or Fea’s flying frog, or if you want to be Latin proper about it, Rhacophorus feae. The whipping part of the name comes from the way in which the female frog uses their back legs to whip up foam to make a nest for their eggs. The word Thao comes from the Thao river, which flows through China and Vietnam. The Thao whipping frog is most, commonly found in parts of China, Laos, Vietnam, Thailand and Myanmar. How do you go about breeding this species of frog? This is our first time breeding them. We raised the temperatures by a couple of degrees and moved them into a larger specialist breeding enclosure, then increased the humidity and sprays. The enclosure is half water with a land area planted with bamboo and large bamboo canes for them to sit on. Within a couple of days of being in this enclosure they spawned! Despite the species being endangered in the wild there is no European Endangered species Programme or studbook in place. There are other collections working with this species – this is not a UK first but it is still another great achievement for Paignton Zoo! The Thao Whipping Frog is one of the largest tree frogs in the world. Despite being known as a flying frog it can’t really fly, it has long toes with strong webbing. It is able to land with control and slow its fall into a slow glide, a trick better known as parachuting. The natural habitat for the Thao Whipping Frog is in tropical forests, rivers, swamps and irrigated farmland. Their frothy nests tend to be near or above the water and the tadpoles drop into the water when they hatch. This species is threatened by habitat loss and collecting for food.